If you want to end something—a partnership, a tenancy, or employment—it must be done with utmost professionalism and by ensuring that parties involved get a good grasp on what the reasons are for termination. This is of high importance especially if there has been a written contract agreement that has been signed by the individuals involved. This is because there might be a few legalities involved if there is a breach. Termination is the process of ending an agreement or contract. However, it will not be so easy in these cases and is something that should be done with utmost care and with careful consideration. There should be a step-by-step process that you should follow in order to make everything go as smooth as possible. One of the first steps that you should be preparing is a notice letter. After preparing the letter or letters, you can start sending your letters to the people who are involved. 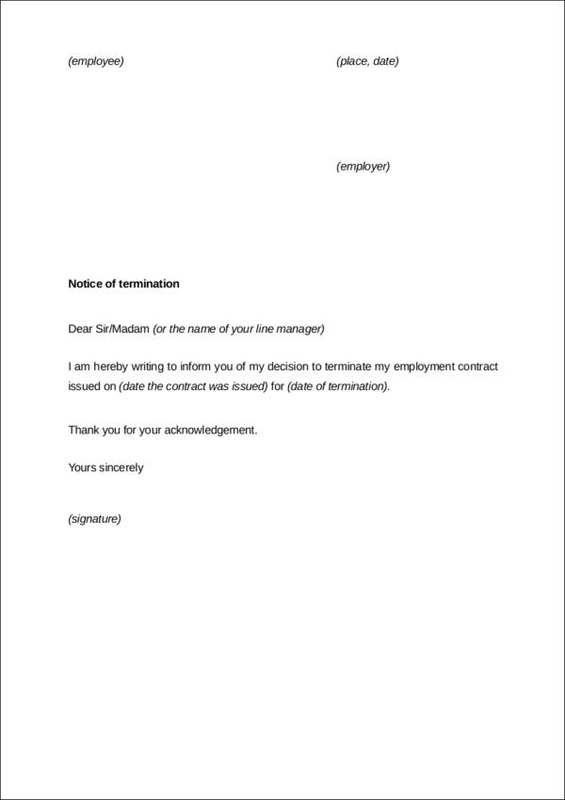 If this is the first time that you will be writing a termination notice letter, you might find yourself confused about formatting and what your letter should contain. We would like to give you a few tips and guidelines that would be of big help to drafting your very own notice letter. Just continue reading this article and do not forget to also check out the sample letters that we have compiled for you. Ready to find out more? Read on! 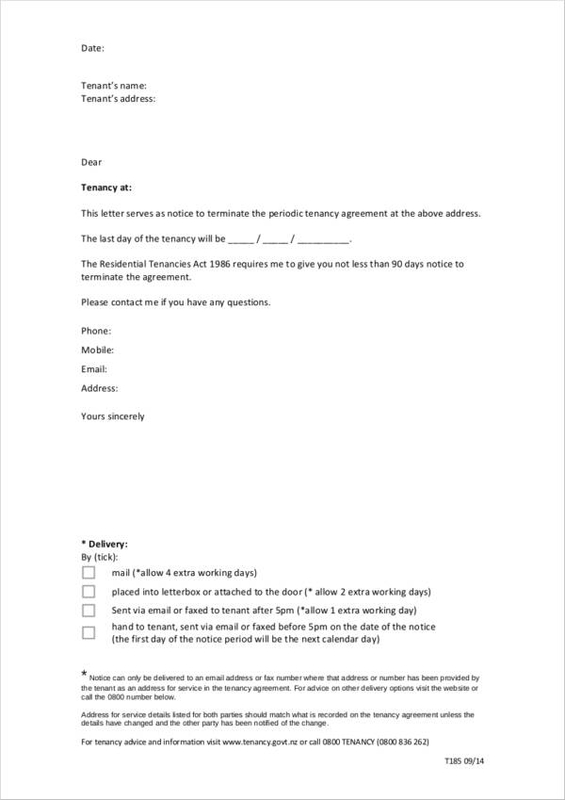 What Is Notice of Termination Letter? A notice termination letter is an official document that is provided to an employee, tenant, or an individual that is deemed to be subject for termination. 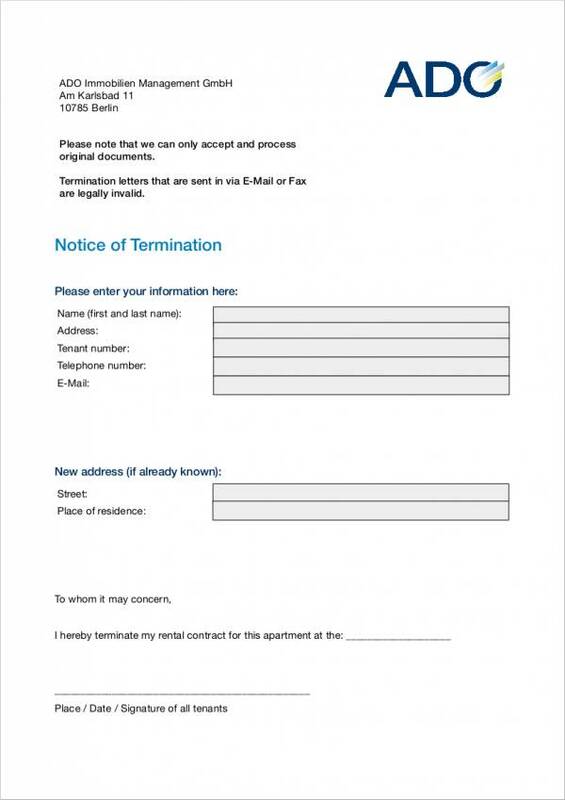 This notice will typically give the recipient of the letter a few days to prepare himself/herself before the date of termination takes effect. 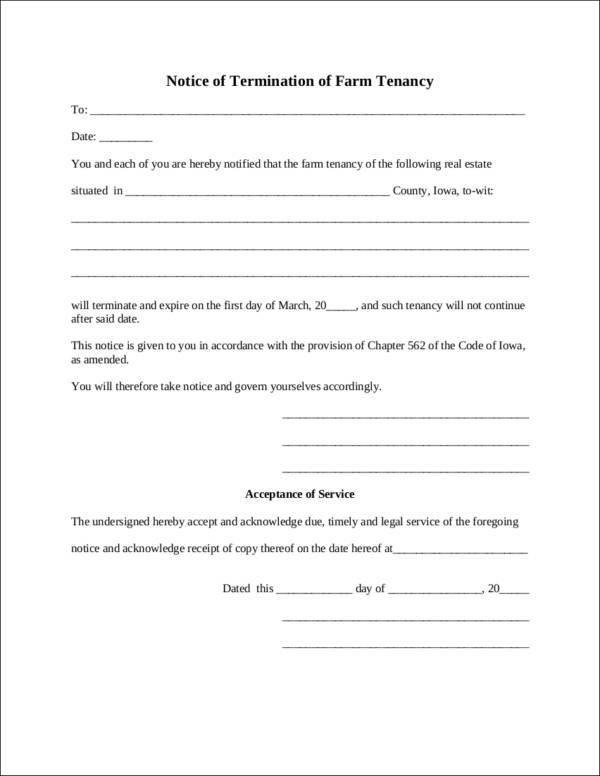 However, there will also be times where the letter will take effect on the same day that it was given to the recipient. Cases such as the latter usually happens when prior warnings, probably in the form of a warning letter, have been ignored or the consequences have not been duly taken into proper consideration by the recipient. When we talk about notice of termination letters, they are usually associated with lease or with employment. 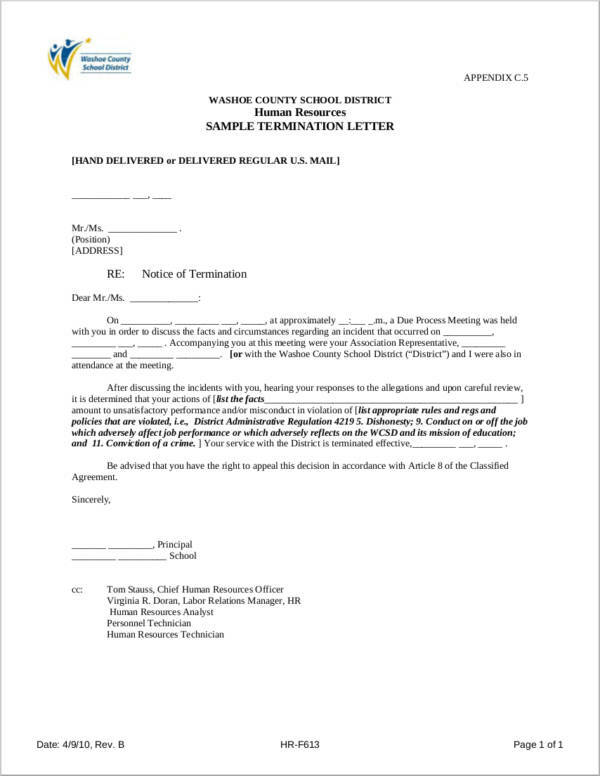 Reasons why these termination letters are sent out may vary depending on the situation or circumstance that it is being used for. Let us expound on that just a little bit. For employment-related terminations. There is a wide-variety of reasons why there might be a need to let some employees go. It could either be for attendance issues, misconduct, or other circumstances where it might be considered by the company that the actions done by the employee is terminable. For lease-related terminations. A tenant will be subject to termination from an apartment or a commercial space if he/she has done an action or actions that are considered by the landlord to be not at par with the terms and conditions that he/she has for leasing his/her property. It can also be due to nonpayment or some warnings that may have been disregarded by the tenant. 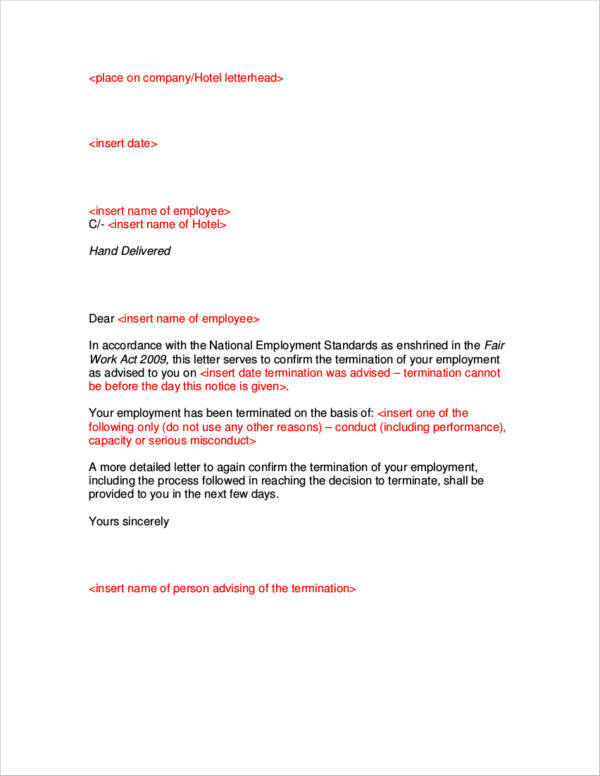 What Should a Notice of Termination Letter Include? 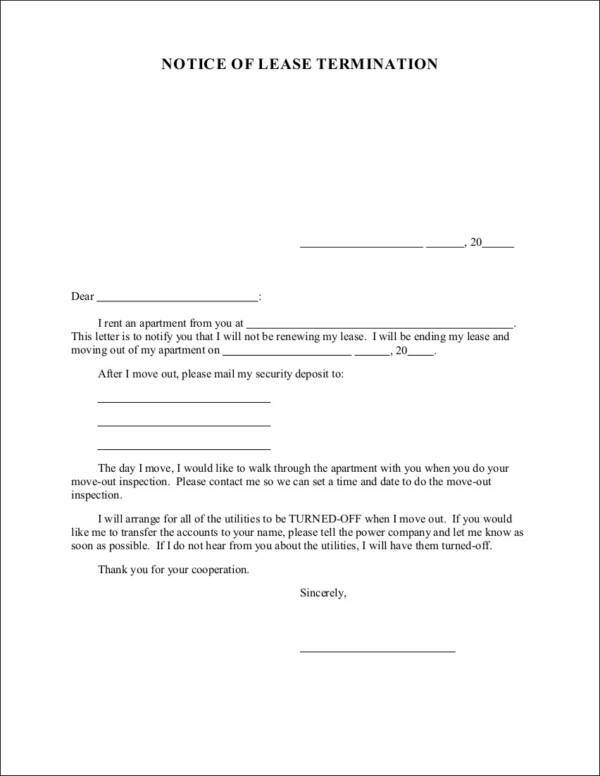 A notice of termination letter, just like any other formal letter, should have all the necessary details that the recipient of the letter needs to know. So what are the details that need to be included in a notice of termination letter? Your details. If this is a business-related termination, including the name of the business may also be a necessary thing to do. It will also be advisable to include the name of the individual curating the termination process. The name or names of the individual or individuals who will be terminated from employment, lease termination letter, or whatever circumstance that calls for the need of a termination. The reasons why the individual/individual needs to be terminated. Be as specific as possible. If there were work evaluations and warnings that were given prior to the termination, do not hesitate to mention this and give the dates when these were given. Include the date when the decision was made and when the letter was written. Include the effective date of the termination. An employee is sometimes terminated from work if the company plans on closing statement or has declared bankruptcy. The employee was employed on terms of a project-based function. 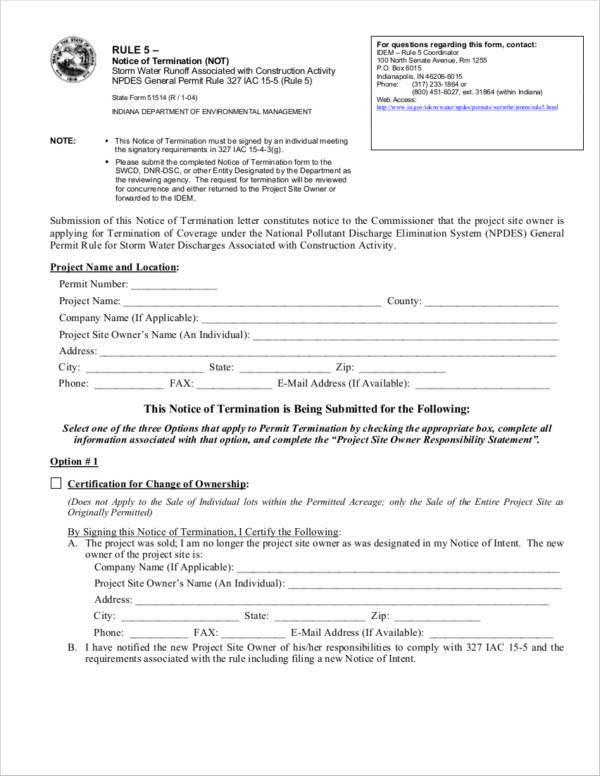 In this case, the termination will include statements that will say that the project has already ended. A tenant who only rented or leased a place for a few days or months. The notice should be given about a week to give the tenant verification time to prepare to pack his/her stuff or to extend his/her lease. We hope you have learned a lot from reading what we have shared with you. By keeping these tips in mind, you will now be able to properly explain to the person why there is a need for him/her to be terminated from his/her job or rented space. This ensures that misunderstandings will be avoided and that there will be any legal actions that will be taken against you. We also hope that you will not forget to check out the sample termination letters that we have included in this very article as these are going to be your guide to knowing what you should include in your letter.